Morgan Stanley is one of the preeminent global financial services’ firms and has its European headquarters in London. They offer a full range of services covering mergers, acquisitions, restructurings, fixed income and equity financing, as well as secondary trading, research, foreign exchange, commodities, securities lending, asset management and prime brokerage. Morgan Stanley employ approximately 5,010 people in the UK. These statistics show that in April 2017 Morgan Stanley were broadly in line or just in front of the industry average. Morgan Stanley have set targets for and reported progress on a significant number of gender diversity initiatives https://www.morganstanley.com/about-us/diversity/UK-Women-In-Finance-Charter - many of these were in place prior to signing the charter. The key target is to increase overall EMEA senior female representation (vice-presidents, executive directors, and managing directors) by 2.5% by the end of January 2019. Morgan Stanley was the first US investment bank to sign the Women in Finance Charter which is testament to their commitment to gender diversity. The Morgan Stanley board, EMEA CEO and the bank’s Diversity Action Council (DAC) focus greatly on gender diversity strategy and accountability and this filters down within the organisation. The DAC is a key driver behind the gender diversity effort, providing thought leadership, collaborating with the Diversity & Inclusion and Talent teams and meeting monthly to discuss progress and initiatives. E2W Comment – It is clear to us that the Morgan Stanley’s leadership team are truly committed to diversity. They have not only taken responsibility themselves but have properly delegated responsibility and empowered agents of change within the business to ensure that change happens. Morgan Stanley are again featured in The Times Top 50 Employers for Women 2018 and have just announced Clare Woodman as their new head of Europe, the Middle East and Africa - the first woman to lead a major investment bank in the City. Morgan Stanley is closely monitoring its candidate shortlist and interview list with regard to diversity. In 2017 over 60% of both candidate and interview shortlists had at least one woman and the bank is eager to improve these statistics. It has been reviewing its recruitment partners and E2W, amongst others, has been selected – we too are eager to improve the statistics and relish the opportunity to help the bank achieve their recruitment targets. 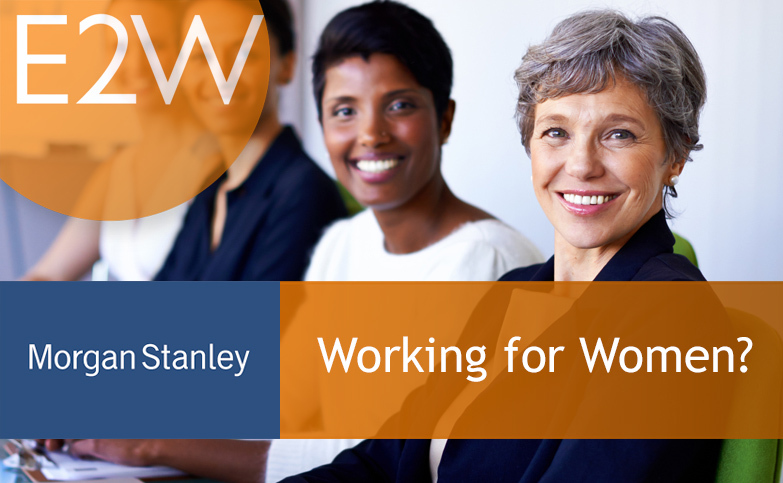 E2W Comment – The Morgan Stanley recruitment team are openly engaged in helping the firm to meet its gender (and other) diversity commitments and will go the extra mile to find and support candidates from diverse backgrounds. Morgan Stanley has a two pronged attack when it comes to maintaining a fluid female pipeline of talent. It places a strong focus on young women, with school and university outreach programmes and for high potential women within the organisation, the bank has strengthened its mentoring and sponsorship partnerships. They also provide a range of leadership programmes for both junior and senior women employees, to equip them with the necessary skills, networks and platforms to achieve their potential. E2W Comment – Morgan Stanley were one of the first to run a returner programme and theirs is one of the most successful in terms of outcomes. Morgan Stanley has implemented several changes to the way the organisation works which demonstrate support for its staff. Manager education – Morgan Stanley understands the importance of sound management and provides training on inclusive leadership, providing regular feedback and nurturing careers as well as topics such as unconscious bias. Family Network – supports parents and carers, providing training and coaching and peer support. Women are supported before, during and after maternity leave and paternity leave has recently been doubled from two to four weeks. Work Smart – this is a new campaign for 2018 which promotes flexible working arrangements, both formal and informal with senior managers leading the charge.